2018 was a record setting year for gaming in the US. The U.S. video game industry reached a new highscore last year. 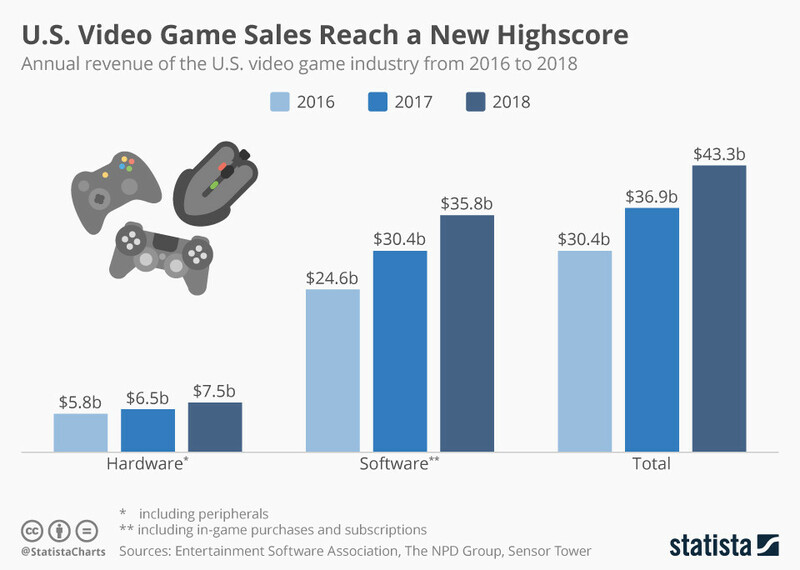 According to data published by the Entertainment Software Industry on 22 Jan, video game revenue in the United States, including hardware, software, peripherals and subscriptions, amounted to $43.4 billion in 2018, up from $36.9 billion a year earlier. “2018 was another record-setting year for the U.S. video game industry”, Mat Piscatella, video games industry analyst at The NPD Group said, “whether it was playing on the go on a mobile device or at home on a PC or console, consumers of all ages and interests found compelling content that delighted in 2018”. To put things in perspective, it’s worth comparing consumer spend on video games to the money flowing into other entertainment sectors: box office revenue in the United States amounted to $11.9 billion in the United States last year, music industry revenue stood at $8.8 billion in 2017 and home entertainment spending, incl. DVD and Blu-ray sales, digital downloads and Netflix-style video streaming, amounted to $23.3 billion last year. Add to that the 220,000 jobs the video game industry supports in the U.S. and it becomes clearer than ever that video games are no mere child’s play.